Truly an exotic and impressive tropical specimen! This Giant Potato Tree is a large bushy shrub that can grow into a medium-height tree, and be beautifully adorned with stunning flowers all year round! A rare treat indeed to see purple blossoms on a tree! And more amazing is that its gorgeous blossoms come in three wonderful shades, changing successively from deep purple to lavender to white. Hence, you can enjoy all the fabulous colours on the tree at the same time, similar to the colourful flowering sequence of Brunfelsia pauciflora, another member of the same family, Solanceae. We got to admire this beauty in the grounds of St Paul’s Church at Kuala Kubu Baru during a local pilgrimage there last year. Absolutely spectacular! Though large, the twin shrubs were young and within arms length that enabled me to simply pull down one of the branches for some close-up shots…how lovely! 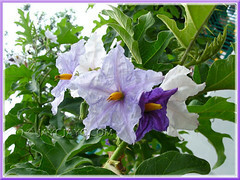 Features: Solanum macranthum is one of the most spectacular species in the large genus, Solanum, that consists of more than 1500 species that includes ornamental shrubs and climbers and vegetables like potatoes, tomatoes and eggplants, plus weeds too. 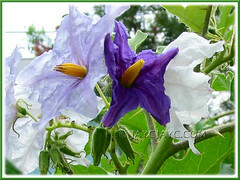 Quite a number of species in the Solanaceae family contain toxic elements, this species included as stated in some sites. It is probably the only species of the Potato family that grows into a tree-like stature, with a woody trunk and several major branches. The velvety green leaves are interestingly large (up to 60cm long and 30cm wide) and deeply lobed with undulated edges, rather unique when compared with other typical leaf blades. However, the downside is that thorns are borne randomly along the pubescent stems/branches as well as on the leaf petioles and the underside of blades along the mid-vein. Hence, do be careful when handling the prickly leaves and hairy stems. Whatever, the Giant Potato Tree makes an excellent ornamental specimen with its abundant flowering throughout the year in the warm tropics. An evergreen and everblooming tree, it produces lovely clusters of star-shaped flowers, each flower has five fused petals and a prominent orange-yellow anthers in the center, just like that of the potato flowers. The colour of the blooms will start off in deep purple and fades to lavender (lilac) and then to white. This colourful sequence in flowering will provide a spectacular display where all the three different coloured blooms will appear altogether in each flower cluster. Simply fascinating! The sweet-scented flowers are large (7.6-8.9cm across), striking and showy, covering the whole tree in favourable growing conditions, and will develop into roundish yellow berries, bearing seeds that can be used for propagation when ripened. 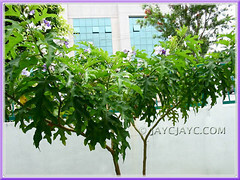 Culture (Care): This Brazilian Potato Tree is an easy plant to grow and maintain. 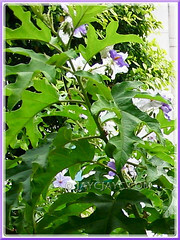 Besides ground-grown, it can grow and flower especially well in containers too. Moisture: Water regularly, keeping soil moist but not soggy. It can tolerate some dryness though. Soil: Prefers humus enriched soil that is well-draining. Others: Regular feeding is beneficial. Tendency for the large bush to appear unkempt or top-heavy, so best to prune regularly and selectively to maintain small size and shape. Generally free from serious pests and diseases, but do check occasionally for caterpillars that may devour the foliage. For subtropical regions: Hardiness: USDA Zone 9b-11. For non-hardy zones, plant them in large containers. It is not cold tolerant at all and will freeze to the ground even when covered or protected (read a grower’s comment at Dave’sGarden), and may or may not recover, depending on the extent of damage. Best not to expose to strong winds or hurricane that may topple it. Propagation: Easily propagated by seeds, stem cuttings or grafting. And, plant will bloom at a tender age, probably when just 60cm tall. Usage: S. macranthum makes an interesting addition to the landscape, great for parks or lining the roadsides and streets. It’s suitable for both large and small gardens, as a standard specimen tree or a large shrub. Ideal as a container plant, in green house or conservatory, especially in cooler regions. If you’re a nature lover, grow it as it’s a magnet for birds and pollinating insects such as the butterflies and bees. Fuchsia species & hybrids with superb flower dangles! I really thought I saw a mangosteen tree. OK..Ok.. Sorry, strayed from the topic. How true, James…nothing like a tree that bears finger-licking fruits and gorgeous flowers too! And, a durian tree seem to top the list…we simply adore its fruits, but to be practical, one can’t grow its tree in a small yard, right? 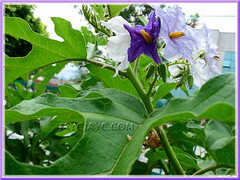 Do you have Solanum macranthum seeds for sale? I can’t seem to find them anywhere!